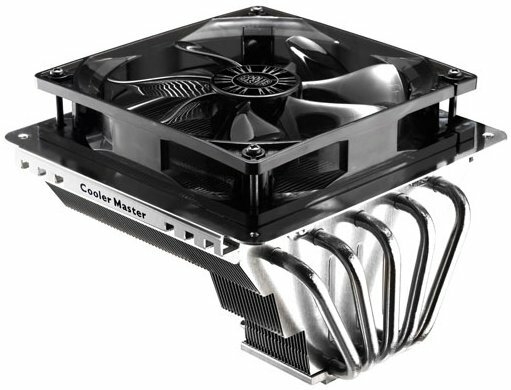 Cooler Master introduced the GeminII S524 processor cooler. It offers a nickel-plated copper base, five heatpipes, aluminium fins and a 120mm fan that provides 34.2CFM - 77.7CFM. Cooler Master, an industry leading chassis, thermal solution, peripheral, and accessory manufacturer, uncovers the ultimate follow-up to the widely popular GeminII CPU Cooler, the GeminII S524. The GeminII S524 is the embodiment of versatility, efficiency, and silence. GeminII S524, a unique alternative to traditional CPU & system memory cooling. Rotated 90 degrees, it harnesses the constant flow of cool air from the side of the system and directs it to the heatsink fins to cool the CPU. Unique to this design, the GeminII S524 channels a portion of this cool air to the system memory to help dissipate the heat generated by critical system components. Benefiting from a larger heatsink surface area, increased clearance for high-end system memory modules, and an easily upgradeable fan, the GeminII S524 claims its position as a transformative cooling solution while maintaining an impressive performance-to-noise ratio. GeminII S524 is an evolutionary new step in CPU cooling. It features a total of five high-grade 6mm thick copper heat pipes that emerge from a large copper base that, combined, offer optimal heat conduction; quickly spreading and removing heat generated by the CPU. To prevent corrosion of its copper surfaces without impacting its heat conductivity, the GeminII S524 base and all heat pipes have been electroplated with a microscopic layer of nickel. The increased surface area of the heatsink and revised fin design of GeminII S524 not only improve its cooling performance but allow for the installation of a 140mm fan, making it a highly flexible cooling solution suitable for any computing environment. The GeminII S524 will be available worldwide in August 16th, 2011 for $39.99 MSRP at retail and online locations that carry your favorite Cooler Master, CM Storm, and Choiix products.